The Borden Flying Club offers a unique flying experience for pilots in Southern Ontario. As a non-profit club we offer something that you cannot find at most for-profit schools and clubs. The Borden Flying Club does not run a commercial operation nor do we conduct primary flight training. Our emphasize is on meeting the needs of our members who all hold at least a Recreational Pilot Permit. Becoming a flying member of the Borden Flying Club is as close to owning an aircraft as you can get without actually buying an airplane. Our plane is privately registered and each member is, in essence, a partner. The club is incorporated which shields our members from the typical liability that is associated with many partnerships. Discounted Opt-in member to COPA available when joining the Borden Flying Club. 24/7 Online Booking - The club has run an online booking system since 2001. You never need worry about calling during office hours to book a plane. Self Dispatch - You do not have to check in with any front-desk staff to go flying. Like any owner, as long as the plane is available you are free to fly it. That does not mean that we do not have recurrency requirements though, because we do. Overnight & Extended Rentals - This is without doubt one of the major reasons cited by new members as to why they joined the club. Our extended trip requirements are designed to encourage members to take the plane places not discourage them. At 3 hours minimum per day for each day away from home field I think you will agree that we offer one of the best deals going on this front. Availability - All that means nothing if you cannot get a plane when you want one. Ever notice that most times school planes are booked by students. That is great when you are a student. How about once you have earned your licence though? We do not run a flying school which means that you are not competing with ab initio students. And just as important, we do not have dispatchers that want to see an instructor in the right seat. Heck, we don't even have a dispatcher. That does not mean that you cannot work towards a higher rating though, such as a night rating or commercial licence - you can. It simply means that our emphasize is on meeting your needs not those of primary flight students. Mentorship - We are big believers in the benefits of mentorship. Our membership includes pilots with a wide range of experience from newly minted to Airline Transport. Many of our more experienced pilots really enjoy sharing a flight with less experienced pilots. It is the perfect win-win scenario. By sharing the cost, both pilots get to fly more and to further destinations. Those that have been there and done that get to share their knowledge. Those that have not, get an opportunity to expand their horizons with the peace of mind that comes from flying with an experienced co-pilot. Get your hands dirty - We encourage our members to participate in aircraft maintenance. Thinking of becoming an owner one day? This is a perfect opportunity to learn what that involves. Find out first hand the costs of operating a single engine piston airplane. Learn about log books, insurance, maintenance and more. Keep in the loop - Ever felt that you are on your own when it comes to keeping up with regulatory changes? We can help there too. We have regular meetings where we invite guest speakers to discuss topics of interest and issues of safety. Regularly held technical/rust remover meetings. Social Events - What would piloting be without a little hangar flying eh? In addition to our club meetings we have several social events each year that you can bring your family and friends to. 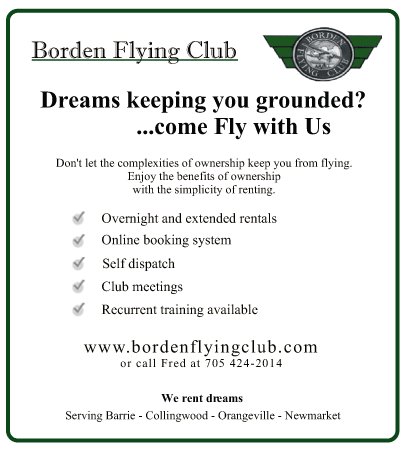 No wonder our members consider the Borden Flying Club the next best thing to owning your own plane. If you would like more information or would like to join the Borden Flying Club please send me an email at President@bordenflyingclub.com or give me a call.